Has it really been over a week since I’ve written anything here? I guess it has. I wish I could tell you that I’ve been off having grand adventures, but the reality is that I spent most of last week, except Halloween, watching coverage of Hurricane Sandy, first on The Weather Channel, and then via News 12 New Jersey, a cable channel that I could live-stream over my Google TV. Now, my mother and I share a love of weather movies and weather disaster films, and I do try not to buy into hype when there’s a real weather disaster, but Hurricane Sandy was personal for me, even though I was dry, warm, and safe here in Texas. Because I was born in Ocean County, NJ at Fort Monmouth. Because I spent the first four years of my life hearing the foghorn wafting over Sandy Hook. Because every summer until I was thirteen, I stayed with my grandparents in Middletown, and went to the beach at Sandy Hook, Ocean Grove, and Avon-by-the-Sea. Because the year I was nine, my mother and I lived in Ocean Grove, two blocks from the ocean. Because when I was little Asbury Park still had a functioning amusement park (I loved the tilt-a-whirl and spinning teacups), and I’ve been to Seaside Heights more than once. Because I remember walking up and down the piers of the Atlantic Highlands yacht harbor before going to my cousin’s diner for rice pudding. Because Sandy Hook, and Fort Hancock (which is out on the Hook) are among my favorite placed on earth, and I have played in the bunkers, and climbed the lighthouse, and built sand castles and learned to swim in the salty blue ocean off those beaches. Because I have family and friends, and friends who may as well be family who have spent the last week and a half bailing water out of their houses, not having heat, not having power, not having working water, because of Sandy, and now today’s snowstorm has some of them without power again. Because even though I’ve lived in Colorado, California, South Dakota, California (again), and Texas, at heart I am, and always will be, a Jersey Girl, and Monmouth County will always be my truest home. After the storm, I went out to Twitter and Instagram and Facebook, searching for images of the places I knew best, the places I loved, and the entry sign at the top of this post is just one of the images I found. 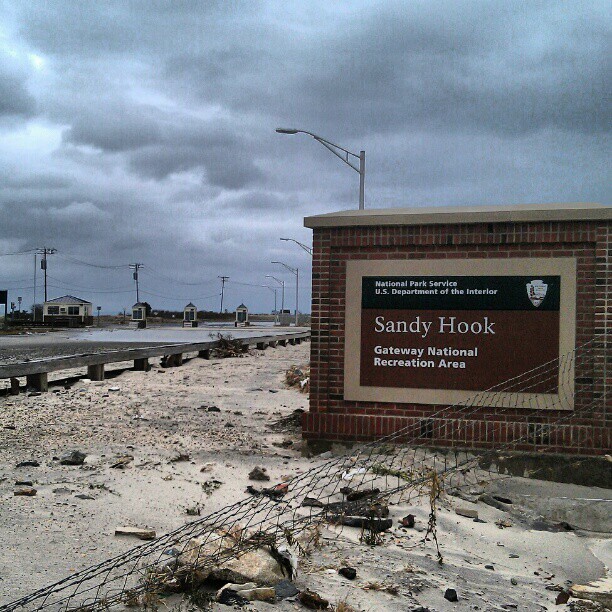 It led me to the National Park Service’s Facebook Page for the Sandy Hook unit of Gateway Park Service (Sandy Hook, NJ; Jamaica Bay & Staten Island, NY) and there, I found images of Sandy Hook and Fort Hancock post-Hurricane Sandy. The beaches are trashed. The parking lots are in disarray. The beach pavillions took serious damage. But the lighthouse still stands, the old houses of Officer’s Row are still there, the Coast Guard dock survived, and even though they’re technically off-limits and covered in poison ivy, future kids will still play in the old bunkers. And New Jersey is small, but strong. Jersey Strong: Sandy Hook Lives by Melissa Bartell is licensed under a Creative Commons Attribution-NonCommercial-NoDerivatives 4.0 International License. wow, massive damage, eh? I’ve never been seaside much. when i revisit where I knew forests are cleared with them and farms covered in houses and yards. heh, like the uncertain worm on the line.